Apollo’s Angels Grain Free Haddock, Sweet Potato & Parsley is a complete, balanced and hypoallergenic pet food for adult dogs. Grain Free recipe dog foods are an excellent choice for dogs with grain intolerance or sensitivity. Apollo’s Angels Grain Free Puppy is a complete, balanced and hypoallergenic pet food for puppies and growing dogs. A blend of high quality proteins and vegetables provide balance an introduction to some really nutritious ingredients. An excellent nutrient rich kibble that is both energy dense and highly palatable, giving your puppy the very best possible start. Apollo’s Angels Super Premium Pet Range are complete feeds manufactured from the very best ingredients. They are wheat gluten free, dairy free, hypo-allergenic and meat derivate free. This means they are especially good for pets with allergies, wheat gluten intolerances, flaky skin or poor coat condition. Apollo’s Angels Grain Free Large Breed Working Puppy / Junior Salmon with Sweet Potato & Vegetables is a complete, balanced and hypoallergenic pet food for puppies and growing dogs. 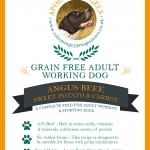 Grain Free recipe dog foods are an excellent choice for dogs with grain intolerance or sensitivity. An excellent complete hypo-allergenic alternative to turkey or lamb, ideally suited for dogs with sensitive digestion. 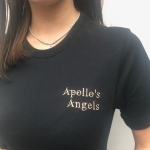 Apollo’s Angels Super Premium Pet Range are complete feeds manufactured from the very best ingredients. They are wheat gluten free, dairy free, hypo-allergenic, meat derivate free and contain only the highest quality meats. This means they are especially good for pets with allergies, wheat gluten intolerances, flaky skin or poor coat condition. A complete food with lamb as the main protein source, an ideal alternative for dogs with a sensitivity to chicken or beef. Apollo’s Angels Super Premium Pet Range are complete feeds manufactured from the very best ingredients. They are wheat gluten free, dairy free, hypo-allergenic, meat derivate free and contain only the highest quality meats. This means they are especially good for pets with allergies, wheat gluten intolerances, flaky skin or poor coat condition.